I don't know about you, but I am a cookbook addict! I love to read them and get inspired. 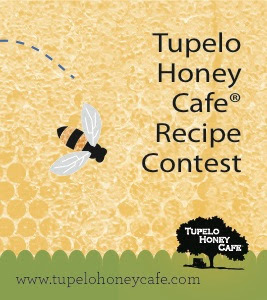 I was recently contacted by the folks at the Tupelo Honey Cafe. They wanted to offer the Plain Chicken readers a chance to win a copy of their beautiful cookbook and let you know about their holiday recipe contest. The Tupelo Honey Cafe dishes up Southern comfort food. They are early pioneers in the farm-to-fork movement. They have two locations in Asheville, NC. They recently opened a new location in Knoxville, TN and have another restaurant slated for Johnson City, TN in 2013. The cookbook is filled full of beautiful photos and incredibly delicious recipes. I plan on making these for breakfast tomorrow morning! Combine the flour, baking powder, baking soda, sour cream, and salt in a large bowl. WIth a cheese grater, grate the frozen butter using the largest holes; quickly cut the butter into the flour mixture with a pastry cutter or fork until the mixture resembles coarse meal. Add the buttermilk to the flour mixture, a little at a time. Stir just enough so it clumps together and is no longer crumbly. Do not overmix. On a floured surface, turn out the dough and roll out to a 1-inch thickness. Using a 3-inch biscuit cutter, cut the biscuits and place on a sheet pan. Cook on top rack of the oven for 20 minutes, or until light brown, and remove from the oven. Brush the melted butter on top of each biscuit and return to the oven for about 5 minutes longer, or until the biscuits are golden brown. Want to win your own copy of this cookbook? Leave a comment on this post and tell me what is your favorite Southern recipe is. The giveaway runs until 11:59pm Wednesday, November 14th, 2012. The contest runs until November 16th, and all entries will be judged by Chef Brian Sonoskus and his hungry team of taste-testers! The three winners will be announced on December 3rd. 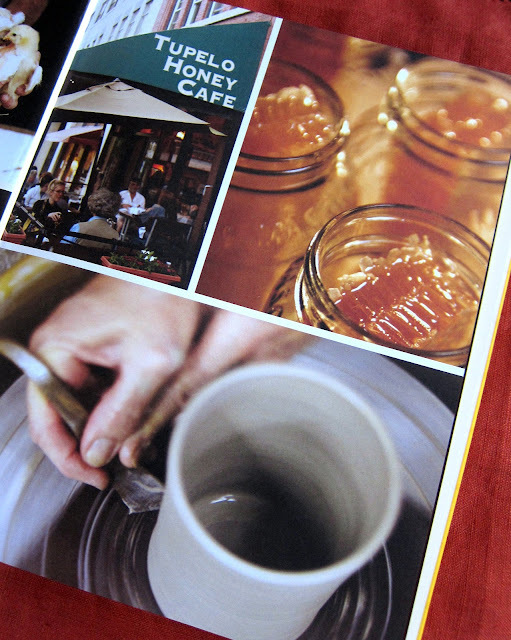 Disclosure: I was given a copy of the Tupelo Honey Cafe cookbook at no cost. All opinions are my own. I think one of my favorite southern recipes would have to be shrimp and grits. And I'm with you about cookbook collecting. I love looking through them even if I never cook a thing from them. Although, making something delicious from a new and/or favorite cookbook is the best! Chess pie - "just pie" - that classic and, oh so simple southern dessert. I love that it can pretty much be made from ingredients I always have (butter, sugar mostly) and that it can be "gussied up" with cocoa or pecans or lemon juice or even coconut. Fried green tomatoes or cheesy bacon grits - YUM! We just ate at the Tupelo Honey in downtown Asheville last week - the biscuits are a-ma-zing. I'm planning to make a batch tomorrow, too - I have the cookbook out of the library, but would love to win my own copy. Fried chicken, sliced tomatoes, fresh corn, just-made biscuits = heaven! My favorite Southern recipe that I have is for biscuits and gravy. We don't have it often but when we do it's a happy home! I grew up in the South & moved to Michigan a year ago. I miss Southern cooking! My favorites are Jambalaya, fried Green Tomatoes, and grits with anything! Oh, and I've been seriously craving some Boiled Peanuts! My favorite is gooey, cheesy macaroni & cheese. My favorite would have to be fried chicken. My favorite Southern dish is Hashbrown Casserole. It is my "go to" comfort food! I love chicken so fried chicken would have to be a favorite...oh and pinto beans!! Love those too! I love grits, grits that have been cooked slowly over the stove for a long time. Yum. This looks like such an awesome book. Just looking at the Southern Fried Chicken BLT makes my mouth water!! Thanks for the giveaway. I love biscuits and gravy. Love southern cuisine. I think my favorite recipe would have to be biscuits with sausage gravy. Oh do I miss living in the south! Thank you for offering this giveaway. Love your blog! My favorite is tomato pie. I love all the fresh tomatoes during the summer! My favorites are creamy macaroni and cheese with collard greens. Cornbread and hominy! I used to beg my Mawmaw to make it for me. Now I make my own using her cornbread skillet. mmm, looks good!!! My favorite is probably chicken and dumplings -- of course, mine are never as good as my grandmother's were! Pimiento and cheese. Love it. Chocolate gravy is second! We just ate there last week in Asheville, soon good. My favorite Southern dish is dried green tomatoes, yum! Southern always makes me think of cornbread. Being from Texas, all my favorites are southern! Favorite is a nice gooey mac and cheese! Also buttermilk fried chicken and waffles, and warm honey biscuits...mmmm. I have too many favorites but if I have to choose, I would say biscuits and gravy or mac and cheese ("macaroni pie", as it's known in our family!) And any dessert containing coconut :-). This cookbook looks amazing and I would love to add it to my collection - thanks for the opportunity to win! I don't think there's anything better than a bowl of butter beans and cornbread dripping with melted butter. Food that soothes the soul! Yum! Homemade Mac and cheese or biscuits and gravy! I love Tupelo Honey Cafe!! I eat there every time I'm in Asheville, which unfortunately isn't as often as I would like. I'm in Knoxville and JC all the time, though, so I'll get my THC fix regularly!! My favorite Southern recipe is red velvet cake! I have to say my favorite Southern dish is fried green tomatoes. There is a restaurant in my town that serves a fried green tomato BLT that is absolutely to-die for! Fried Green Tomatoes during the summer. At New Year's we always had to have Black Eyed Peas and Greens to bring in the New Year. Too many good things to pick from! But one of the first things that comes to mind is Pecan Pie, yum! I had lunch at The Tupelo last summer! What a great place. My favorite? After a life of Southern food? It would have to be the Shrimp and Grits that my youngest son and I make every year at Sunset Beach, NC. Seriously good! Let's see...fried chicken or fried green tomatoes would have to be my favorite southern foods. My favorite Southern Dish is King Ranch chicken and/or fried green tomatoes. Oh dear, there's red beans and rice too...gosh, hard to pick, love all southern cookin'! My made from scratch chicken and dumplings of which I don't have a written recipe- I have to "show" you the recipe- that's how "from scratch" it is! Cat-head biscuits, warm syrup, & fresh sausage! I live in the South and there are so many recipes that have been handed down that are my family's favorites. For me it's a tie between a truly grand pound cake and my own creation of pimiento cheese. Both dishes are asked for again and again at work pot luck dinners. Southern Fried Chicken has got to be my favorite and my hubby's. Pecan pie and I love biscuits and sweet tea. At my home sweet tea is also known as "nectar of the Gods"! I would love this cookbook in my collection! This would be a wonderful addition to my cookbook collection, thanks for a chance to win one! My favorite southern recipe is pecan pie and another is pimento cheese. Chicken fried steak, biscuits and heavy, and fried green tomatoes! Fried chicken, pecan pie, green peas and dumplings, i need to stop! I'm getting hungry! Southern Buttermilk Biscuits are my very favorite recipe...especially when paired with crisp bacon and southern grits! Tomato Pie is my absolute favorite! The recipe in this cookbook looks so yummy!! Your recipes are always so inspiring for this fellow working woman who loves to cook! I am from the South, so eating "Souther" food is normal for me. My mother and grandmother are/were both AMAZING Southern cooks. My mom was raised in the cotton fields, and all her recipes are from scratch. My favorite recipe is probably biscuits and gravy. My husband made fresh gravy for his guy friends this weekend on their get-away, and none of them had ever had it from scratch. They all thought it came from a packet. How sad! I love country ham and biscuits. Fried cornbread has to be #1, pimento cheese sandwich on white bread a close second. There is nothing quite like the deliciousness of friend chicken and homemade biscuits! crittyjoyblog (at) gmail (dot) com. It is so hard to pick just one Southern dish but I guess I will say Shrimp and Grits. It is always so good! Bread pudding....oh, so many things! Thanks for offering the giveaway. This cookbook looks soo yummy! Thanks for great blog reading, too! fried chicken, or chicken and dumplings! yum! Cornbread! My husband just ate at Tupelo Honey in Knoxville. He really wants me to win this cookbook! Fried pork chops, fried okra, fried corn, hush puppies. My momma grew up in Georgia, so southern food is my favorite! I love cookbooks!!! I found a great recipe for Southern Crusty Coconut Pie. I make it for church dinners & it's gone in 10 minutes!! Fried Okra, you just don't get more southern than that. Fried chicken, with mashed potatoes, cream gravy and corn on the cob. I love Tupelo Honey Cafe! I live in SC and just ate there in Asheville in July for my birthday dinner! My favorite southern recipes include shrimp and grits and Fried Green Tomato BLT's (bonus points if it has pimiento cheese, too)! Favorite southern recipe? Hands down pimento cheese! Oh, tough one between pimento cheese and pecan pie! Love the Tupelo Honey Cafe! I am still learning to cook southern, but I have mastered biscuits, chicken & dumplings, and sweet tea! Great opportunity! My favorite southern recipe is hashbrown casserole! My fave Southern food is my Momma's cornbread dressing! And homemade Pimento Cheese! Oh there are so many! We ate at Tupelo Honey in downtown Asheville Saturday and I have to say, that was the absolute BEST biscuit I have ever had. My husband agreed. We will definitely stand in line to get another one next time we are in Asheville. My favorite southern recipes has to be whipping cream poundcake...YUM! Chicken fried steak with sawmill gravy... couple that with some mashed baby reds and a heaping spoonful of butter corn - MmmmmMMmmmmm!! I WISH I knew how to cook southern. I love everything southern, it's all comfort food and delicious to me! I would love to learn to make yummy biscuits. I actually ate lunch at Tupelo honey recently--the biscuits were absolutely divine. I think summery foods are my favorite Southern items--chicken salad, pimento cheese, sweet tea. Yum, yum. My Grandmaw Georgia's corn casserole. It still remains one of my favorite dishes. My favorite is the Pecan Pie Squares from the Texas restaurant. I love those things! That book looks VERY interesting! Oooh! I have so many southern favorites but I really LOVE a good pecan pie! I love, love, love biscuits! Growing up, our neighbor's mom (that is, the mother of the wife) used to make them with lard. Bad for you, I know, but so good. And she never measured. A true Southern cook! My favorite southern main course recipe is shrimp and grits (no bacon, though!). For dessert I absolutely LOVE a good buttermilk pie! love collard greens with bacon! My favorite southern food would have to be gumbo. Fried Chicken and Biscuits !! YUM ! My favorite southern recipe is Cornbread Dressing! I love Luby's Mac-n-cheese recipe it is the best mac-n-cheese ever!!! Hands down and no doubt....Biscuits and Tomato Gravy. It don't get any Southerner than that! Fried pork chops with smother fried potatoes and hot buttered biscuits! Shrimp and grits has to be my favorite southern dish. I try it everywhere we go! I love all the different versions. Thanks for the giveaway. My good friend Ken gave me his recipe for tomato gravy and biscuits and it is delicious and very southern. Biscuits and sausage gravy or chicken fried steak. Yum! My favorite southern recipe is shrimp and grits. Nothing better! cheesy grits and sweet potato pie! Shrimp and grits and fried chicken.. This northerner didn't know what she was missing until she moved South... YUMMM!!!! Love, love, love your blog! My hubs is a die hard Crimson Tide fan, so every time I make one of your recipes, I have to point out to him that it came from an Auburn grads blog, lol. Anyway, my favorite southern recipe would have to be red velvet cake. I had never heard of it until my husband asked me to make one from his Grandmothers recipe about 15 years ago. Now it seems red velvet has popped up everywhere! My favorite southern recipe is taco soup! Pat Conroy's Shrimp and Grits recipe....yummm!